Using hashtags on social media seems simple, right? Sure it’s easy to add a #MotivationalMonday or #WednesdayWisdom to your social media posts. But what really works? In the always changing world of digital content, what worked last month certainly won’t always work in the next. Here are some tips to becoming an expert #hashtag user. On Facebook, think less is more. Ever notice that posts on Facebook don’t use a lot of Hashtags? That’s because more is not always better. It’s important to note that Facebook uses hashtags as a way to categorize conversations. The algorithm works to compare posts about similar topics and link them together by context. Stick with 1-2 hashtags on Facebook. Maybe even come up with a brand hashtag you use consistently. Quality over Quantity on Instagram, too. Instagram is the front runner when it comes to social media. Industries including eCommerce, retail, services, and products can benefit from using Instagram to promote their business. The platform allows up to 30 hashtags per post. But that doesn’t mean you should use the full amount. Again, quality over quantity. 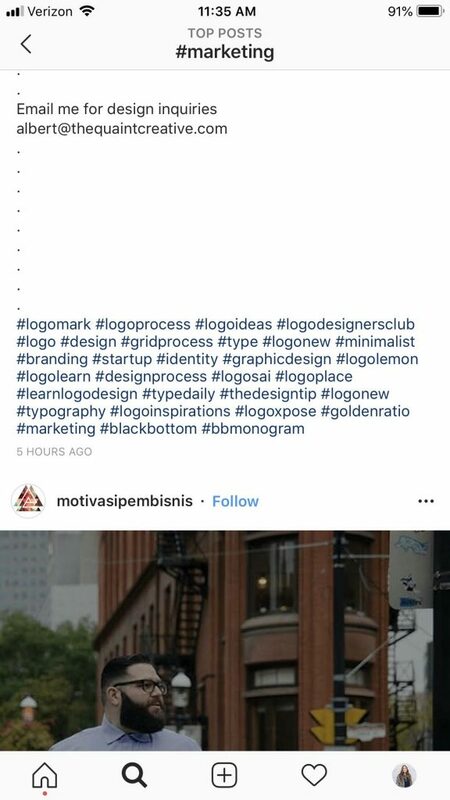 Thanks to the new Instagram Algorithm, irrelevant hashtags are categorized as spammy behavior. Because of the ability to follow hashtags on Instagram, when you use an irrelevant hashtag to your post, people who follow that hashtag can choose to not show your post for that specific hashtag. So hashtags must be relevant to your content. The danger of using popular hashtags like #follow4follow and #likeforlike is that you’re not necessarily gaining quality followers. It’s most likely users looking to inflate their own follower account. They won’t engage with your brand. They won’t share your brand. One of the main goals of social media is a large reach. How do you do that? You need more social engagement. Increasing your follower count is one way to ensure your content is seen by consumers, customers, and potential customers. You can do this through the use of relevant hashtags. Followers alone won’t increase your brand visibility. Likes, comments, shares, tweets, reports, and more from people who enjoy the content you are creating is key. Those are valuable, meaningful engagements. Using popular hashtags like #followback are only going to increase the likelihood of spammers for followers. Do your research. What are your competitors using? What are people in the industry doing? How about influencers? On Instagram, there’s an easy way to find out. For instance, type “marketing” in the search bar. 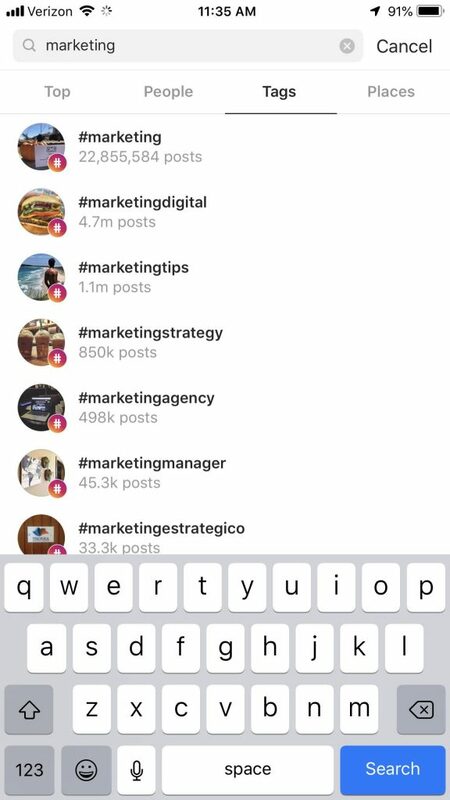 Under the tags field, click on one of the hashtags to see the top posts using that hashtag. Now scroll through the posts and see what hashtags they are using. This is a great way to discover popular and relevant hashtags for your brand. Want to reach a more targeted audience for your brand? Specific, niche hashtags do well (especially on Instagram). This is one way for you for stand out from your competition. They’re a great way to start conversation with your followers and increase the reach of your content. Your consumers who share relevant content with their own followers can use your branded hashtag to share your brand. It can be as simple as your company name, tagline, product name or campaign. At Of the Sea, we use #OftheSeaAdvertising. It needs to be simple and catchy. One your followers can easily remember. You can also use niche hashtags to promote new products, let your followers get a behind the scenes look, use a custom hashtag for an event you host, and more. Have any other tips on using #hashtags on social media? Let us know in the comments below.